A multidisciplinary research project that combines history, zoology and halakhah, and with the collaboration for part of it with several partners, among them Rabbi Prof. Ari Zivotofsky, Dr. Ari Greenspan, and Rabbi Dr. Hannanel Seri. This is a documentation of authentic kashrut traditions from the elders of the previous generation from all Jewish communities and salvaging them for future generations. Documentation of tradition was conducted through interviews of hundreds of informants, photography, and activities of disseminating traditions in public, such as in traditional meals of the animals which had been identified. Alongside this, the publication of many books and articles in the field. This work is carried out with the cooperation and guidance of eminent rabbis and authorities in the field. Among the animals documented is the tradition of eating partridge, Guinea fowl and pheasant, quails, sparrows and other songbirds, as well as mammals such as deer and gazelles. A study in itself was the documentation of the eating of kosher locusts in Jewish communities in Yemen and North Africa. The research also deals with current issues, such as the granting of kosher certification to the meat of the jamus [water buffalo], in a joint project with the Chief Rabbinate, and reinforcing halakhic permission to eat עוף ברברי and Zebu cattle. In the course of the study, we will examine in depth the issue of the kashrut of the giraffe through anatomical analyses, in cooperation with rabbis and the staff at the Safari in Ramat Gan. An unusual study, in collaboration with Dr. David Iluz and Dr. Uzi Merin, examined the validity of the criterion of milk curdling to determine the kashrut of an animal. Examination of pure and impure milk of mammals showed that only the milk of a ritually clean animal curdled. This is a practical criterion that has been accepted in theory and enables halakhic arbiters to decide controversial issues, such as the kashrut of the red deer. Israel’s Chief Sephardic Rabbi Shlomo Amar is granting a kosher seal of approval to the Asian water buffalo. He made the decision after Prof. . Zohar Amar, of Bar-Ilan University’s Martin (Szusz) Department of Land of Israel Studies and Archaeology, and Prof. Ari Zivotofsky, of the university’s Interdisciplinary Brain Sciences department, with the support of Shmulik Friedman, director of Grazing Land in Israel in the Ministry of Agriculture, presented Halachic, anatomic, and historic evidence regarding the slaughter of water buffalo in Jewish communities to him. The two, who are experts in the kashrut of exotic birds, animals, and grasshoppers, also presented him with testimony gathered from ritual slaughterers who slaughtered water buffalo in the past in Jerusalem, Petach Tikva, Bnei Brak, and the Galilee. Prof. Zohar Amar (left), Chief Rabbi Shlomo Amar (center), and Prof. Avi Zivotofsky following Rabbi Amar’s inspection of Asian water buffalo at Moshav Bitzaron. 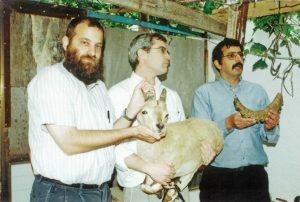 (Meshulam Levy)Rabbi Amar then met with the research team, which included dentist Dr. Ari Greenspan and representatives of the Ministry of Agriculture, in the Hula Nature Reserve, where he saw firsthand the herd of water buffalo raised there and examined the dental structure of scattered skulls from deceased water buffalo. Approximately two years ago, beef breeders applied for permission to breed the animal, Bubalus bubalis (Asian water buffalo, which is known by its Arabic name Jamus), for the purpose of marketing the beef for consumption. According to data from the British Mandate period, 5,000 of these buffalo were raised in Israel until the establishment of the Jewish state, and today a small number remain in the Hula Nature Reserve. In Israel, water buffalo have not been slaughtered over the past half century and the Chief Rabbinate has not awarded kashrut approval. Water buffalo meat is sought after by certain populations and has market potential within Israel and abroad. Authentic mozzarella cheese is produced from water buffalo milk, which is also noted for its medicinal uses.The researchers are hopeful that collaboration in the future between scientific researchers and the Chief Rabbi will lead to the kashrut approval of additional animals and birds.